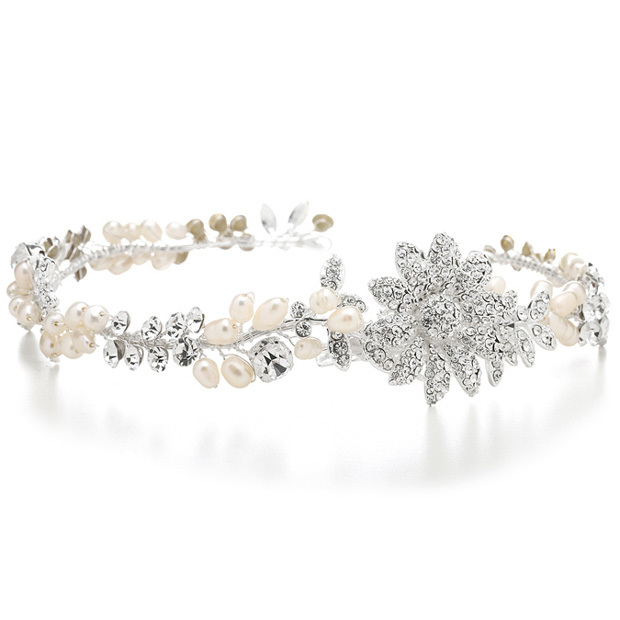 * The Mariell editor's choice for one of the most beautiful headpieces in our collection is this designer Wedding Tiara Hair Vine or Headband in Freshwater Pearls and Crystals. * This glamorous one-of-a-kind wholesale wedding vine is a stunning flexible tiara or headband to adapt to any hairstyle. * The silver headband is adorned with graceful pave daisies & clovers. * Add this irresistable and versatile headpiece to your store's "hair jewelry" display! * One of the most beautiful headpieces in our collection is this 13" L Bridal Tiara Hair Vine or Headband in Freshwater Pearls with Crystal flowers. * This bejeweled vine is a flexible tiara or headband and has 2 eyelets & has a spring clip behind the daisy.